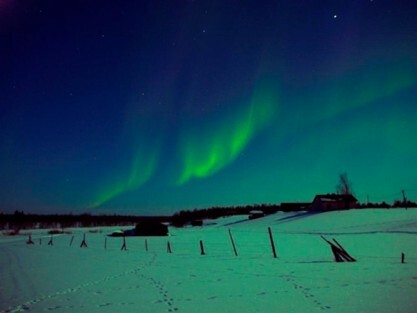 After a day of hard work, the staff team here in Saariselka were treated to a team building event of experiencing the Northern Lights Adventure. We all kitted up, wearing our own body weight in thermals and woolly layers and waded our way through mounds and mounds of crisp snow to find an entourage of snowmobiles, lined up and raring to go. 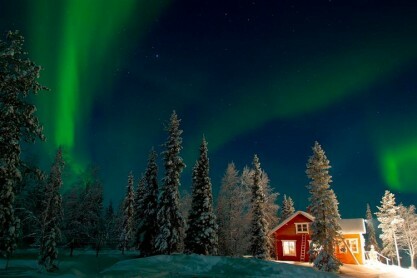 We partnered up, hopped on and off we went, into the untouched winter wonderland of Lapland’s back garden. Passing weeping pine trees that were laced with sparkling snow, feeling the cold wind turn our blushing cheeks crimson, and screaming and laughing whilst we whooshed through the beautiful scenery was just the beginning of our Northern Lights Adventure. After what felt like a lifetime of magic, we pulled in to a small nook in the woods to be greeted with a cup of hot berry juice and ginger cookies around a blazing fire. 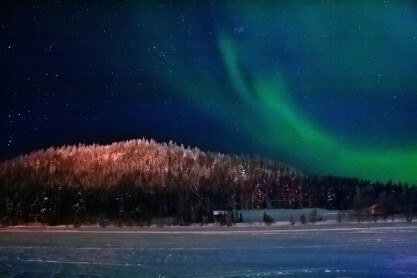 Once we were refreshed, we continued on our journey to find the Northern lights. By this point we had been having so much fun we forgot what we were looking for! About 5 minutes into our return journey, everyone began to silence, and all the passengers heads turned to fixate on the wonders above us. Low and behold, there they were in all their glory – The Northern Lights. For a moment I felt as though I had been transported to Oz, the Emerald City, as the sky danced and glistened with the most beautiful lime green lights. It was hard to believe it was real. At that moment I realised, that in fact THIS was the most incredible moment of my life to date. Never in my life have I been so breath taken by something so natural and magical. The lights began to dance, and tease their way further and further away from us. 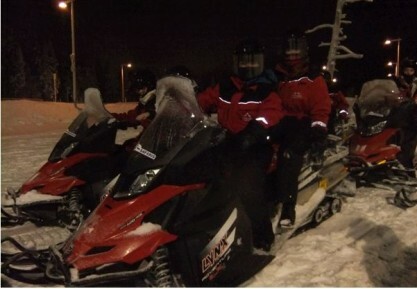 As a convoy of snowmobiles, it became a race – us versus the Aurora Borealis! The term “Once in a Lifetime” is a common cliché, thrown around for mediocre experiences, however seeing the Northern Lights is truly the REAL meaning behind this phrase. However, we have been so fortunate here in Saariselka that we have in fact seen the Northern Lights 4 times, each time brighter and brighter. Words cannot describe the feeling that comes with seeing something so amazing and awe-inspiring, and to be able to share this experience with a great group of people – what more can I ask for! ?